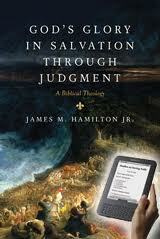 God’s Glory in Salvation through Judgment, by James M. Hamilton Jr. Try and summarize the Bible in one sentence. Karl Barth, author of the infamous 14 volume Church Dogmatics, is said to have summarized all that he wrote by saying, “Jesus loves me, this I know, for the Bible tells me so.” Others have focused on a variety of themes as the “main and plain” central motif of the Bible, some helpful and others lacking. But what is the central theme of the Bible? What makes up the central focus of God’s revelation through Scripture? This is a question that seems to be answered by way of biblical theology, right? This year I have begun spending more time studying on the topic of biblical theology. When Brian Fulthorp mentioned that there was a great sale at Westminster Bookstore for the NSBT series, I jumped on it. That means I ordered the set of 26 books and have been slowly working through them… slowly. For me, biblical theology has become a passionate hobby and I think it has so much to offer us. And yet I feel as if the subject is quite new and unexplored for myself, to some degree. So when Hamilton released God’s Glory in Salvation through Judgment: A Biblical Theology, I jumped on the opportunity of reading it and reviewing it (thanks, Crossway!). Dr. Hamilton is associate professor of biblical theology at The Southern Baptist Theological Seminary and the author of one of my favorite books on the Holy Spirit (God’s Indwelling Presence). He also blogs at For His Renown. I consider Hamilton one of evangelicalism’s upcoming great scholar theologians. Every book or article I’ve read has been absolutely fantastic. Okay, my only complaint about the guy is that he didn’t push back more during the Desiring God sponsored “evening of eschatology” (audio and video here). Come on, Dr. Hamilton, you should have jumped on Storms and Wilson and shown them why Historic Premillennialism is exegetically superior to the other views (ha ha… joking… kind of… ha ha). This definition follows after Hamilton interacts well with Geerhardus Vos’ definition and understanding of biblical theology. Vos is known for his Biblical Theology, and was a champion for recovering biblical theology to to the minds of many evangelical scholars. Unfortunately, his working definition has been misapplied by scholars, hence Hamilton’s above definition. Hamilton’s purpose in writing this specific biblical theological study is to “pursue a biblical theology that highlights the central theme of God’s glory in salvation through judgment by describing the literary contours of individual books in canonical context with sensitivity to the unfolding metanarrative” (p. 44). Let’s break that down for everyone. In God’s Glory in Salvation through Judgment, Hamilton is essentially suggesting that the central theme of the Christian Scriptures is that God is glorified by providing salvation through judgment. Christians should recognize the subtle nod towards the substitutionary atonement made by Jesus Christ on the cross. While the culmination of God’s plan of redemption is found directly in the life, death, and resurrection of Jesus, this theme, according to Hamilton, is found from the beginning to the end of our scriptures. God’s Glory comes in at a total of 639 pages. Within these pages are not only examples of exegesis and theological reflection, but a variety of illustrations and tables (88 by my quick count). Most books include a brief one page “table of contents,” right? Hamilton includes a ten page analytical outline. This might sound like overkill, but it’s not. God’s Glory is written to build up the church, and it’s clear that Hamilton is doing all that he can to help readers get the most from the book. Thus, the analytical outline is wonderfully helpful because one can quickly scan through his work and find exactly where he addresses the subject in relation to Exodus, Isaiah, or the Gospels. Or perhaps you are interested in finding how the proposal interacts with 1 John’s theology concerning “the world,” among other subjects. God’s Glory is quite comprehensive. “Let me invite you to consider a different way to approach the reading of this book. I would be thrilled, of course, for you to plunge right in and go from start to finish. Some will do that (I hope). Others may find this approach more helpful: browse through this book, finding your way to the introductory and concluding paragraphs of chapters and sections of chapters. Dipping into these paragraphs will give you a feel for the book and introduce you to its shape and argument… browsing the whole at one sitting will let you see the forest, which will in turn help you see the trees… If you are teaching James tomorrow, you have my permission (as though you need it!) to go directly to the section on James…” (p. 29). Don’t let the comprehensiveness scare you. This book is worth it’s weight in gold, in my opinion (oops, revealing my conclusion a little early, huh?). And I’d encourage you to take the author’s invitation to read the book different than you’d read most books. Jump around, it’ll be worth it. As I read through Hamilton’s proposal, I couldn’t help but marvel at how clear his thesis is. He defines God’s glory as “the weight of the majestic goodness of who God is, and the resulting name, or reputation that he gains from his revelation of himself as Creator, Sustainer, Judge, and Redeemer, perfect in justice and mercy, loving-kindness and truth” (p. 56). Sounds very Piperish, right? I think the same vision that captured Piper has captured Hamilton, and it’s quite the vision. But how the phrase “salvation through judgment” is fleshed out is a bit more complex. It appears that Hamilton wants to maintain both the mercy and grace of God along with the righteousness of God. He states that “salvation and judgment balance one another” (p. 57). For the rest of the book, Hamilton fleshes this central theme out, beginning in the Torah and working throughout the rest of the Hebrew Scriptures and into the New Testament. It is fascinating to read the insights that Hamilton provides us with and the clarity with which he writes is especially appreciated. What I appreciated about this book is that it’s clarity is both comprehensive, complex, and yet understandable. I’m thinking that readers who do not have seminary training or biblical language acquisition will still gain much from this work. Pastors and interested Christians will both be able to pick up this work, read it, engage it, and understand it. Clarity… lots of clarity, both in substance and in style. “The center of the Psalter is the glory of Yahweh. This glory will be manifested as Yahweh shows his righteousness against his people’s sins, and through that judgment he delivers them to trust him. Having triumphed over unrighteousness and delivered his people from their own wickedness, Yahweh is glorified as his people rely upon him alone. Yahweh then triumphs over the enemies of his people, and through the judgment that falls on the wicked his people are saved. They respond in glorifying Yahweh. The glory of God in salvation through judgment is the center of the theology of the Psalms. It is the experience of the individual psalmist, and it is the experience of the nation of Israel. Yahweh shows justice and mercy, and his people praise him” (p. 290). Sure, Hamilton, but the Psalms are a softball pitch, right? What about the Song of Songs? Worry not. The author explains how “the intimacy lost at the fall (judgment) is renewed (salvation), and the beauty of God’s intention is celebrated (glory)” (p. 307-308). Thus, the marriage described in SOS actually points to this center as well. “I would suggest that the center of biblical theology has specific application to announcing what God has done and persuading people to believe in Jesus (evangelism), to teaching all that Jesus commanded (discipleship), and to pursuing the purity of the bride of Christ (corrective church discipline)” (p. 566). Honestly, this is my favorite book of 2011. That’s saying a lot, as I’ve probably read nearly 35 books this year. But none of them have spurred as much reflection and study as Hamilton’s. 2009 was Total Church. 2010 had too many to name a “best of,” but I’m confident that this point in 2011, God’s Glory in Salvation through Judgment will be the stand-out. Thanks Dr. Hamilton. I hope everyone purchases this work and that in twenty five years you are still putting out this kind of quality. Praise the Lord! Thanks for this very encouraging review! It was my pleasure… great book, Dr. Hamilton. GREAT book.